I, the well-travelled Regis of Werta, alumnus of the College of Werta, cartographer of the illustrious Count Eldred Gladwyn and Acolyte of the Order of the Gilded Fork, penned this small booklet to accompany you on your exploration of Hildred’s Land. An unexplored continent full of opportunities, but equally dangerous. What is a traveller without a loyal and knowledgeable companion, if not all but lost? Especially with the rugged landscape and morose people of this land! You know little about local customs and might well end up in a predicament embarrassing yourself or worse locked-up in a dank dungeon for a minor transgression. Or you may be unfamiliar with local foods and spices and end up with an upset stomach. A night’s rest on scratchy, soiled straw will surely not heighten your spirits, nor will bad craftsmanship or overpriced merchandise. You will need all your wits and, naturally, this fine booklet to traverse stick and stone and gain fame and fortune in Greifshold! 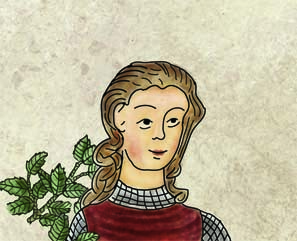 No doubt you will have heard of Hildred of Jorburg. Not unlike me he was an explorer of a curious and gallant disposition, the first to cross the Turquoise Sea to Serpent Bay, to sight the shores of what its native people call “Alperda” and to set a foot on this mountainous, forested land. He exchanged gifts and tales with the natives, but only went as far inland to what is known today as Starspire, an observatory located on a steep hill. This was little more than hundred years ago. Knowledge of this unexplored wilderness, rich in wood and wildlife and coastal waters teeming of fish and whales, spread fast throughout the provinces of the southron empire. Soon whalers and tradesmen followed Hildred’s initial expedition. Missionaries attempted to bring Reigaro’s light to the people of this land, who we call Hengemen, and the illustrious Aldrich of House Gladwyn founded the only major settlement on Hildred’s Land: Greifshold. He brought the tribes of the land into the imperial fold and got them accustomed to the achievements of our great civilisation. Soon after he was named Margrave by her Serene Highness Empress Milburga Sunniva. Only two decades later the Margravate spanned from Serpent’s Bay in the south to the foothills of the Wyrmblood Range in the north, from the fishing village Breka in the east and along the pasture of the Green Bent in the west with the strongholds Griffonwatch and Wyrmrock guarding its limits to the northwest and northeast to keep the ever unruly Hengemen in check. A map of the Margravate of Greifshold. Drawn by Gilford of Jorburg. As I write these lines vast spans of Hildred’s Land are still unexplored and even less is known about its ancient history and the ruins and remnants of this era extant to this day. Now more than ever after an upheaval of the Hengemen – called Herleva’s Rebellion – was crushed a few years ago. With Griffonwatch and Wyrmrock lost, the coastal areas around Greifshold and Breka are still save to travel, but to venture forth into the forest is dangerous and tidings from the north seldom find their way to the homely taverns of the city. A great many noblemen and their followers perished and the presence of the illustrious Margravine Elswyth of House Gladwyn is not felt in the north. Yet the Green Bent is still safe to travel and was untouched by the upheaval. It is a well explored open pasture, dotted with orchards, fields and farmsteads. It is Greifshold’s bread basket and you can expect the farmers to be hospitable should darkness settle over the land and you are in need of lodgings. The small hamlet of Oak Bridge at the forest’s edge is also a good place to rest before you venture forth into the woods. The Green Bent follows the natural shape of Serpent’s Bay westwards until the gentle foreshore turns into sharp rocks and oak and fir reach out to the rockfaces caressed by the rapacious sea. Greifshold commands the centre of The Bent and lies only half a day’s travel west from the fishing village Breka. Further east the Green Bent ends at the foothills of the Wyrmblood Range, only a day’s travel from Breka. We now call the forest to the north of The Bent the Weeping Forest as it brought death to the bannermen of illustrious Aldrich and the Hengemen alike, but the natives refer to it as “The Cradle” or “Wiegalant” in their tongue. 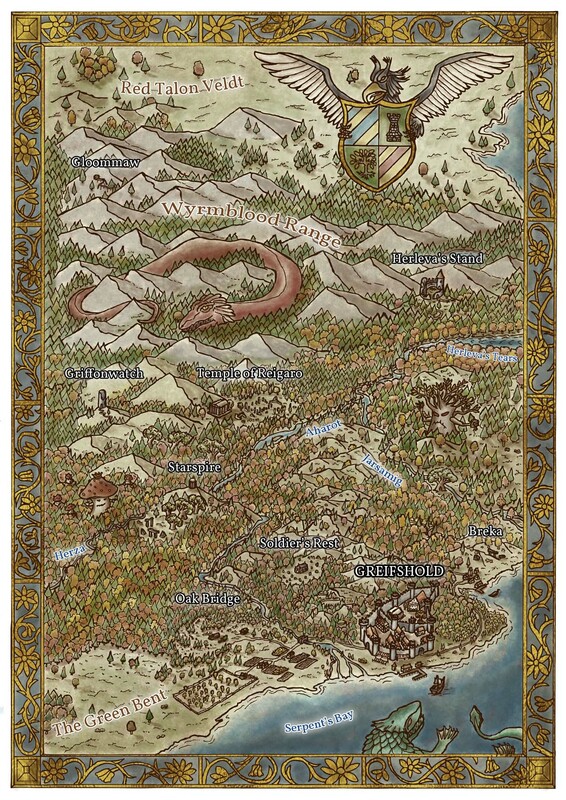 Before Wyrmrock’s fall the northeastern forest was called the Wyrmwood and the northwestern part Black Quill Forest. Margrave Aldrich’s mount, the griffon Ebonquill, used this area as its hunting grounds. The forest extends further to the west as far as the eyes can see. No one I spoke to set foot in those parts. A drawing of the curious rock formations close to the lakes referred to as Herleva’s Tears by Timotheus of Greifshold. Three rivers divide the forest, two of which are arms of the Aharôt, the principal river of the Margravate. The Aharôt has its source in the three lakes called Herleva’s Tears. It flows north to south and unites with the sea west to Greifshold. The Herza flows east to west and splits from the Aharôt at Starspire. It is unknown where it ends. The Jarsamig flows north to east and passes the Balding Hills and Breka before it unites with the sea. I understand this river has some significance in the pagan cult of the Hengemen. The Wyrmblood Range forms the northern limits of the Margravate, yet its foothills extend deep southwards and form a stretch of hills just north of Greifshold. The city itself is in part build on a gentle hill. They are called The Balding Hills, due to the sparse growth on most of them. I have it on good authority that iron ore was found in these hills and they may as well reveal precious stones in time. The northern parts of the Wyrmblood Range are not well travelled and should be avoided in winter. The area around Herleva’s Tears is supposedly quite pleasant. 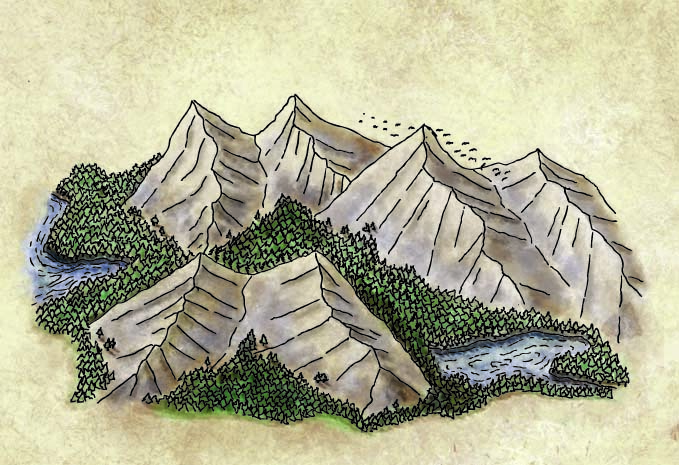 Three lakes surrounded by forest and mountains, one of them crowned by the remains of Wyrmrock. I was not able to travel there given the uncertain times, but a ranger told me that the best way to travel north is by boat along the Jarsamig and then the Aharôt river. Herleva the Oathbreaker. Killed during the siege of Wyrmrock. Drawn by Arlo of Werta. What lies beyond the Wyrmblood Range is for the most part unknown. A large expanse, called the Red Talon Veldt, stretches far to the north and west. Whalers report of fierce beasts roaming these lands, but I was not able to talk to anyone that travelled the Veldt first-hand and can thus not confirm these rumours. The Hengemen tell tales of an old pass in the range leading to an ancient portal, hewn in the very rock of the mountains. The tribes belief it holds an ancient evil, but more enlightened scholars suggest it is a remnant of the civilisation that preceded the Hengemen, which they simply call “The First” or “Eristo”. Finally, to the east beyond Breka and the foothills of the Wyrmblood Range, Wyrm’s Claw peninsula is located. It is sparsely populated and heavily forested. Its seashore is not as fertile as the Green Bent, but the waters teem of whales. Some scholars suggest that the forest hides remnants of The First, as artefacts have been found at the delta of the river Glatskinan, which snakes west to east across the peninsula and also has its source in Herleva’s Tears. The native people of this land call themselves “Gilih”, which I believe means “Equals”, but we call them “Hengemen”, after the structures scattered around the forest they cherish so much. They have no king, no counts, nor knights. They hold no titles and have no holds. They are a morose people, as rugged and harsh as the forest they dwell in and lack all but the simplest markers of civilisation. They never stay long in one place and life in tents and makeshift huts. They hold the Henges sacred and often convene at those places, to what end I do not know. They seem to organise in tribes, but little is known about how many tribes there are or what name they bear. The Hengemen occupying the forest around the city call themselves Îwawer, but I heard of other names such as Tanwer and Gelower. Some moved to Greifshold over the years to leave behind their wandering and restless life to get accustomed with our culture. Most Hengemen work at the docks or offer their services as hunters and guides, some work as herbalists and peddlers. I also saw some crippled begging on the streets of Greifshold, but the Black Candle hands out food to those in need so that they find their way to Reigaro. “When the gods first created life they favoured strong, gargantuan creatures that roamed land and sea. They shaped them in their image, grandiose and tempestuous. They created Agrioth, the first wyrm, and Hithra the first serpent. They brought Alperda forth from the waves for Agrioth to rule, and at first it was barren and flat. Hithra’s realm was the sea, and at first it was stormy and without life. The gods decided to turn barren soil into verdant pastures and to fill it with lesser beings to feed Agrioth. Hithra’s realm they filled with fish and whales to satiate her appetite. Both grew large and soon envied the other. Why was Agrioth confined to the land, why Hithra to the sea? Soon envy turned into hatred and the gods saw their creation was flawed. Agrioth, the Earthshaker. The first dragon and mortal enemy to Hithra drawn by Gilford of Jorburg, court historian and cartographer. One day Hithra took a bite out of Alperda to spite Agrioth, forming the Serpent Bay. Blinded by anger he bellowed her name and challenged her to a fight. They struggled for seven days and seven nights and finally Hithra buried her teeth deep into his long neck and ripped out his flesh. Mortally wounded Agrioth cast her into the waves, as she was weak and exhausted by the fight. She sank to the ground and fell into a deep slumber. Agrioth pleaded to the gods to help him, but they were disgusted by their creation, that had grown vein and cruel. It is noteworthy that we have similar tales, foremost the tale of the sea serpent Keto. I believe Hithra and Keto are thus the same creature. Some sailors believe that Keto is responsible for the winter storms of Serpent Bay, as she grows unruly in her slumber and her movements and fastened breath churns up the sea. They also believe she awakes once every few decades to still her hunger, swallowing ships whole and filling her greedy stomach with swarms of fish and dozens of whales. Only then she sinks down to the seabed, to slumber again. It would be worthwhile to collect and compare the Hengemen’s oral versions of this tale to our written legends. I intend to do so when the current tensions have subsided. I hope you enjoyed this first look on the geography of the Margravate and the myths of its indigenous people. Part two is forthcoming and will be dedicated to the grand city of Greifshold. If you like the artwork and need a notebook for your next DnD session, a mug or poster for your office, a new cover for your smart phone that shows your love for all things fantasy or simply a nice art print to hang into your man cave or femme den, check out my store on Redbubble. If you would like a PDF version of this guide with adventure hooks, terrain building, painting and roleplaying tips consider supporting me on Patreon. You will get access to a high-res version of the map, different versions of the frame and also to detailed background materials on the history of the Margravate to aid DMs. There also other choice rewards for supporters. Thank you. I still try my hand at emulating a semi medieval style. I guess it is most obvious with the Herleva portrait. When I get to a larger depiction of the city I will try to work in the often wonky perspective of that particular historical style. I am glad the historical flavour comes through in the text. I though I keep it low fantasy, with some enclaves of magic and beasts thought to be long extinct. This way I hope to add some mystery and interest.